Xian Lim says that he always wants Kim Chiu to feel happy. As the Primetime Bida series My Binondo Girl nears its finale this coming Friday, January 20, the hit teleserye comes out with more breathtaking revelations and sweet surprises. Viewers have become hooked on the kakakilig love story between Jade and Andy, and the romance seems to have moved off-camera as well between actors Xian Lim and Kim Chiu. When asked if Kim is the most special girl in his life right now, Xian saidmatter-of-factly, “Of course. She deserves to be happy. And she deserves to be treated well. I do these things for her maybe because I find her special. That’s probably why. There’s something about her na talagang wow. It’s about how she makes me feel. I can’t really say but I just know that she’s special,” he admitted during the My Binondo Girl dragon finale press conference held last January 13 at the Choi Garden Restaurant. Even though he has yet to admit he is officially courting his co-actor, Xian did not deny doing sweet things for Kim these past few months. The heartthrob admitted he has given Kim a giant teddy bear, roses, as well as other gifts during the course of the six months of taping for the show. “I want her to feel special all the time. Every time magkasama kami, every time kung lalabas kami, taping man yan or trabaho, at least I make her feel special in every single way pag lumalabas kami,” he said. Over the holidays, the 22-year-actor even commissioned a choir to surprise Kim on their set. “I was thinking kung ano nga bang regalo ang maganda para sa kanya so naisip ko na kung i-a-add ko yun, sana ‘pag nasa taping siya para maramdaman niya kahit papaano,” he added. 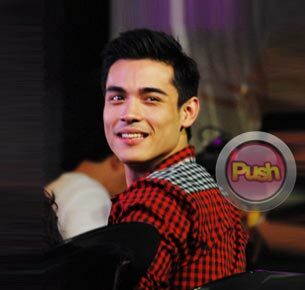 Xian admitted that he almost got into trouble with the church because of that sweet gesture. He also clarifies that it was a genuine gift and not a publicity stunt as some people might think. “Muntik na nga ako mapagalitan nung pari kasi dapat makabalik sila sa mass by a certain time but thank God okay naman. Kumakanta yung choir na yun sa iba’t ibang churches for charity so naisip ko yun. I thought of the idea. Wala naman pong nagsasabi sa akin kung ano ang dapat gawin. Wala namang ganun,” he stressed. As their show nears its dragon finale, Xian said that he will continue his close friendship with Kim even after My Binondo Girl. “Oo naman of course. Siyempre I always think na sana magkita pa rin kami hindi lang naman nagkikita kami. Sana naman hindi ganun. Lumalabas kami. Kami nila Matteo (Guidicelli) tapos dati nga nag-church pa nga kami eh. Nag-ka-kain kain,” he said. When it comes to their growing friendship, Xian wants to leave things open-ended as to whether it will blossom into something more. “Ang masasabi ko po sobrang saya kasama si Kim. We’re just taking it step by step, kung anong mangyari, mangyayari naman po yan. Whatever is meant to be is meant to be,” he shared. For more updates on Xian Lim and Kim Chiu, log on daily to Push.com.ph and follow @Push_Mina on Twitter.